Triple Milled Castile Bar Soap | What is triple milled soap? When you buy all-natural Carolina Castile Soap bars, you’re getting the very best in triple milled soap. But wait, what does that even mean? Milling soaps has been around for nearly 300 years. Today’s soap milling involves running soap through smooth stainless-steel rollers just after it becomes saponified, or of a solid material after all of the liquid ingredients harden. Instead of a simple milling process, truly elite soaps—like Carolina Castile Soap bars—must endure at least three or more trips through the mill, which results in a much purer product that’s also smoother to the touch. While you can certainly over-mill a soap until it’s dry and unable to moisturize the skin, typically three to four millings will yield a truly special product. Many of our customers are familiar with our liquid Castile soaps in a variety of natural scents, ranging from lavender and peppermint to orange, lemon, and almond. While our liquid Castile soaps have a large fan base for household use (kitchens and bathrooms, even laundry!) and personal use, our bars are now the soap of choice for many in North America and Europe. Our all-natural, triple-milled, unscented bar soap is true Carolina Castile Soap and arrives in six-packs of five-ounce bars for bath and handwashing use. To make our bar soap the best, Carolina Castile Soap makes every bar superfatted and super creamy, using organic fair trade cocoa butter and organic fair trade olive oil, both certified by industry standard-bearer Oregon Tilth. Another interesting phenomenon of triple-milled soaps is that they don’t deteriorate as quickly, leaving greasy blobs in your soap dishes. Why? Well, the milling process produces a more compact version of the soap, as the mill yields a product with more tightly packed ingredients. Thus, not only does triple-milled soap feel better to the touch, it also stays together and lasts longer. 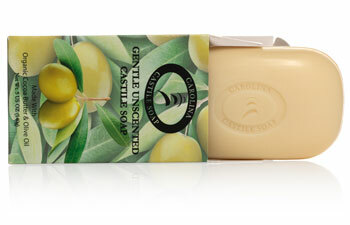 If you haven’t tried Carolina Castile Soap’s unscented bars, get them for your next shower. Bars are available, along with all varieties of liquid soap, at www.carolinacastilesoap.com and Amazon. New scents are coming soon!